“I’ve had people ask what my real name is,” Wendell Castle says. It’s a laughable notion to anyone who knows the man, whose work is rooted in authenticity. As one of the first American designers to challenge the boundary between utility and fine art, Castle creates an enticing breed of objects marked by superior craftsmanship and ingenuity in form, style, and technique. His creative fuel consists of a wild imagination paired with the calm, steady work ethic of a Midwestern farm boy. It gives him the utmost pleasure to create a successful piece under his own terms: a once unthinkable concept of furniture that doubles as art. The show focuses on “Block” and “Freeform,” two new series made by stack lamination, a process that Castle pioneered in the 1960s. Layers of wood are glued edge to edge and then carved out to create lens-shaped seats perched on wiggly, trunklike bases. In a nod to his love of jazz, each is named for a city synonymous with the music. “Block” references Renaissance sculpture, in which a marble figure’s base is left unfinished, to support the weight. Castle interprets the method on a horizontal scale, so a seat, hovering in midair, extends sideways from its base via a joint covered in chisel marks. “I’ve been trying to figure out where the legs go,” Castle says. 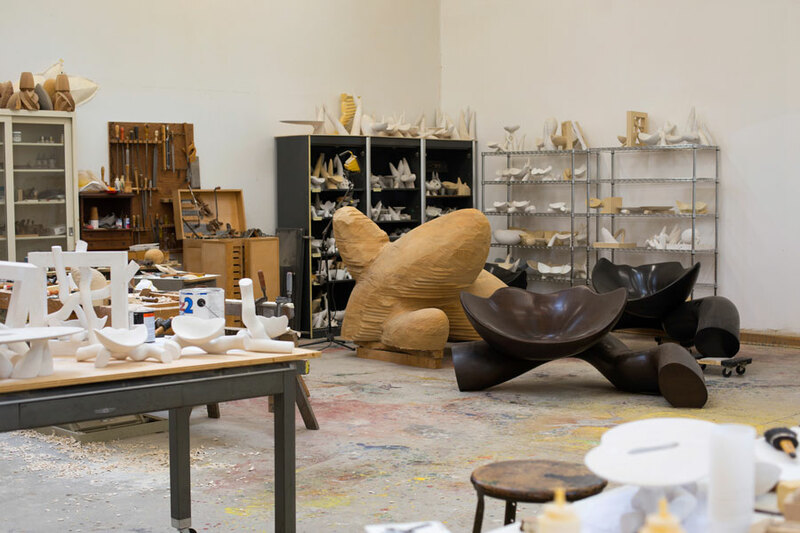 “They can go anywhere except the four corners—that’s not allowed.” Case in point: “Dante’s Heaven,” the exhibition’s lone cast-bronze object, consists of a bucket seat with legs grouped around its back like an array of unicorn horns. In October, Rochester’s Memorial Art Gallery will present an expanded version of “Wendell Castle: Remastered,” which originated at the Museum of Arts and Design about a year and a half ago. 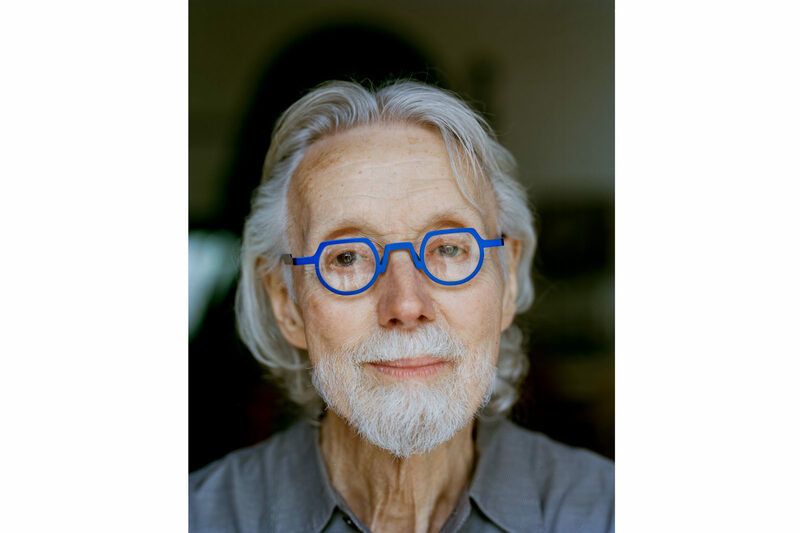 Next year, the Nelson-Atkins Museum of Art in Kansas City and Nerman Museum of Contemporary Art in Overland Park, Kansas, will mount concurrent solo exhibitions for Castle, who has four honorary degrees, an American Craft Council Gold Medal, and work in more than 50 institutions. It’s the latest in a surge of exposure for the notoriously humble designer. And despite his 84 years, he shows no sign of slowing down. Castle grew up in Kansas. He loved to draw—cars, in particular—but his parents invariably tossed his work in the trash. 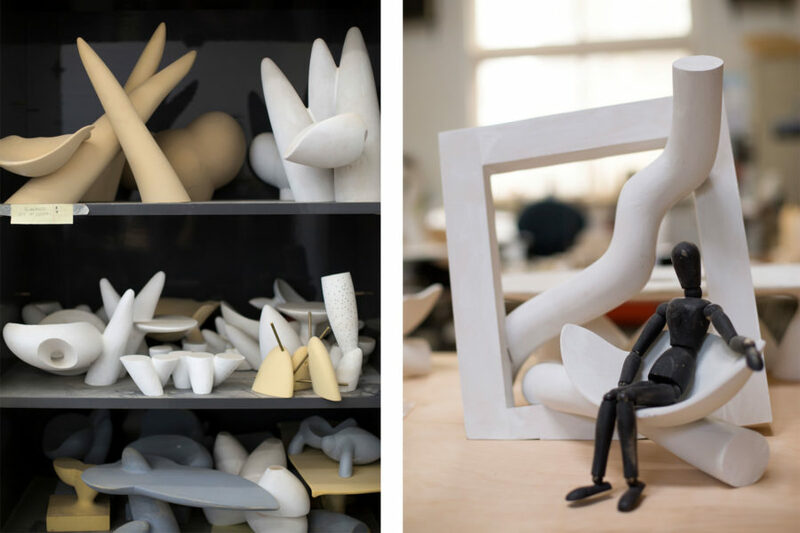 He took his first art class in college, and flourished, pursuing industrial design and sculpture degrees from the University of Kansas. “The general thought then was, if something had a function, it couldn’t be fine art,” Castle says. “That was a dilemma: I didn’t want to give up on sculpture, because I felt it was a higher form of art. But I also didn’t understand why furniture was so low on the totem pole.” His breakthrough occurred while making a cabinet, which an instructor deemed a waste of time—he should get back to making sculpture. Castle wondered, Why can’t furniture be art? and set about proving his teacher wrong. 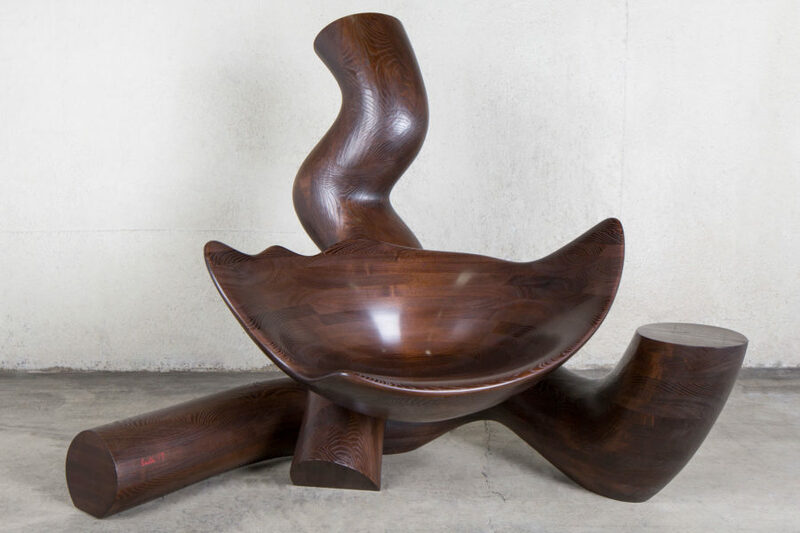 The resulting “Stool Sculpture” (1959), a sinuous branchlike counter stool, wowed the instructor and was later exhibited as sculpture around the world. With a trim figure from decades of wielding a chainsaw, Castle is soft-spoken, good-natured, and present. Jonathan Binstock, Memorial Art Gallery’s director, told me Castle never misses an opening in Rochester. He’s easy to spot: Castle’s flashy suits contrast with his signature Anne & Valentin glasses, which he owns in five colors. When he picked me up at the airport, he casually rolled up in a 1996 Bentley Brookland. The man lives up to everything he does. Castle’s 10-person studio, a former grain mill he bought in 1968, spans 15,000 square feet. 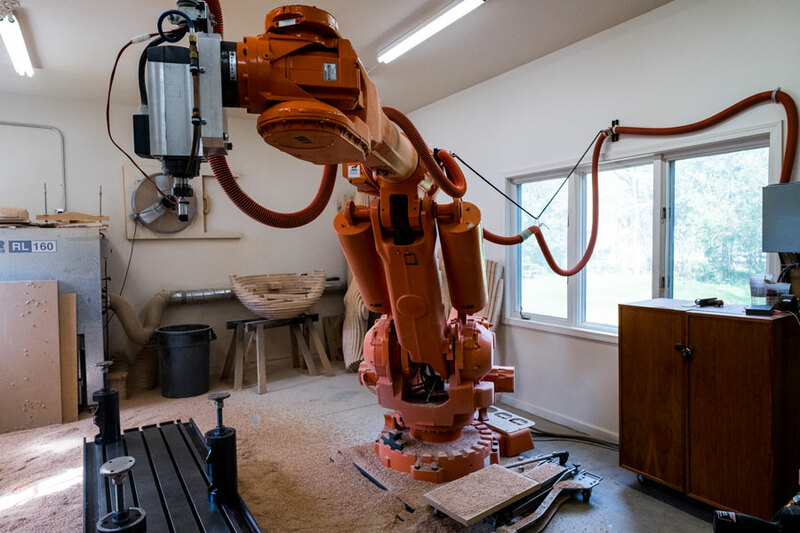 It is a maze of making: During my visit, most rooms were inhabited by craftspeople operating big-boy toys—one housed a 5,000-pound tangerine ABB robot called Mr. Chips. Ceramic sculptures by Castle’s wife, Nancy Jurs, line a stairway, while his collection of classic cars—a 1985 slant-nose Porsche 911 Turbo, a 1949 MG TC, a 1970 Jaguar E-Type convertible—fill the garage. Sawdust abounds. Posters of his “10 Adopted Rules of Thumb,” a collection of commandments he’s continually amassing, feature prominently. Castle, who’s also a musician, told me he’d like to incorporate them into a song. Looking back over his career in the mid-aughts, Castle decided to revisit his stack-laminated, nature-inspired shapes—a vocabulary that’s his alone. Unlike other furniture makers, Castle maintained consistent gallery representation over the years. It was a recipe for an utterly remarkable career resurgence, one in which Castle sort of riffs on his own work. His 2010 series “Rockin’”—inspired in part by an encounter with his 1963 “Sleigh Lounger”—revisits a rocking-chair theme using the tilted-wheel motion of a Bugatti race car for its supports. He turned his 1969 self-reflection chamber inside out with “A New Environment” (2013), which takes the form of communal space. With an R & Company commission, Castle reintroduced a fiberglass dining table and floor lamps in black-and-white using the original molds, giving his ’70s stint a strong second wind. Castle’s most radical development folds a robot into his process. He uses the machine, customized from its previous life at the U.S. Postal Service, just as inventively as he did a chainsaw in the ’60s: Castle now works out his sketches by carving a model in urethane foam, which is then 3D-scanned, divided into sections, and printed as a series of patterns for each successive layer of wood. Using the scan, the robot cuts out slices, which are then joined and laminated by hand in the studio. The method extends Castle’s body while creating small, crazy-shaped voids impossible to accomplish otherwise.